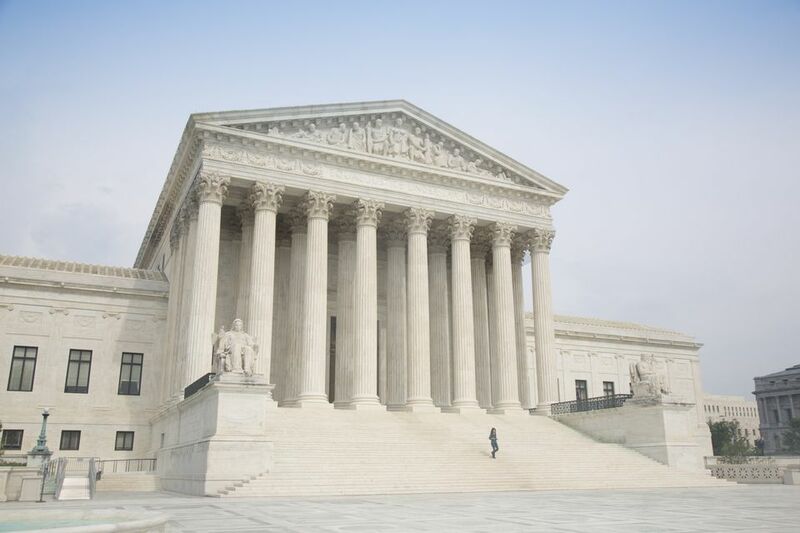 The U.S. Supreme Court is an interesting place to visit and many people do not realize that it is open to the public. The Court was originally located in the Capitol Building in Washington, D.C. In 1935, the current U.S. Supreme Court Building was constructed in a Corinthian architectural style to match the nearby congressional buildings. On the front stairway are two statues, the Contemplation of Justice and the Guardian or Authority of Law. The Chief Justice and 8 associate justices make up the Supreme Court, the highest judicial authority in the United States. They decide whether actions of Congress, the President, the states and the lower courts follow the principles of the Constitution. Out of approximately 7,000 cases submitted each year to the Supreme Court, only about 100 cases are heard. The U.S. Supreme Court is located on Capitol Hill at First Street and Maryland Avenue in NW, Washington, DC. It is across the street from the United States Capitol. Visitors can enter the Supreme Court building from the plaza doors located on each side of the main steps. There is an accessible ramp on the left side of the building on the Maryland Avenue side. The Supreme Court is in session the first Monday in October and court sessions continue until late June or early July. Visitors may view sessions, which begin at 10 a.m. (check the calendar of the court for that day's agenda). Seating is limited and given on a first come, first served basis. Seating for the first argument begins at 9:30 a.m. while seating for the three-minute line begins at 10 a.m. There are times the sessions may be closed to the public at the discretion of the Court. The Supreme Court Building is open throughout the year from 9:00 a.m. to 4:30 p.m. Monday through Friday except on federal holidays. Portions of the First and Ground Floors are open to the public. Highlights include the John Marshall Statue, portraits and busts of Justices, and two self-supporting marble spiral staircases. Visitors can explore exhibits, see a 25-minute film on the Supreme Court, and participate in a variety of educational programs. Lectures in the Courtroom are given every hour on the half-hour, on days that the Court is not in session. A line forms in the Great Hall on the First Floor before each lecture and visitors are admitted on a first come, first served basis. When you go to Capitol Hill, plan a full day of sightseeing and visit nearby attractions including the Capitol Building, the Capitol Visitor Center and the Library of Congress. What is the Washington, DC's Newseum? All About the Ronald Reagan Building in Washington, D.C.